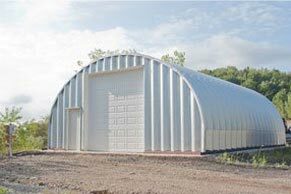 Oregon metal garage kits and steel arch buildings custom manufactured in The Beaver State for small business, commercial and residential use. Oregon metal garage kits by Metal Building Kings® are pre-engineered building systems are guaranteed for 40 years. 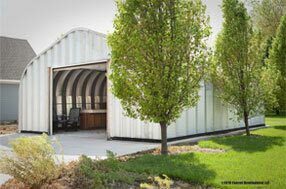 Buy Oregon metal garages, steel arch buildings and metal garage kits at Metal Building Kings® at factory direct prices. Find out how much your building costs by using our pricing calculator or our discounted kits calculator. Or check out our sale prices for garage kits that we already have in stock and ready to ship. 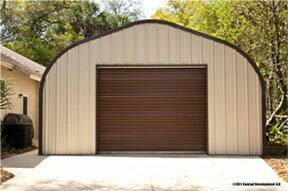 Metal garages are guaranteed with a 40 year warranty and custom manufactured with your choice of 14 to 22 gauge 80,000ksi tensile yield carbon steel coated with aluminum-zinc alloy and silicon. The special AkzoNobel Ceram-A-Star® 1050 paint used on all Oregon metal garage kits is a silicone-protected polyester coil coating system designed exclusively for Metal Building Kings® steel buildings and comes in 5 main colors that are Energy Star and LEED compliant. Metal Building Kings® distribution locations in Portland, Medford, Eugene, Bend, Salem, and Gresham will receive your garage kit for shipping from our factory that includes all the building's components and instruction manuals and expedites delivery throughout the state to all 4.013 million residents in 36 counties. Choose from 4 different metal garage models that vary in roof slope, arch design and wall slants. You can browse the different building here. The metal arches that form the garage kit are machine roll formed at our factory and have a 7.5 " deep corrugation. Each panel is fastened with 2 rows of grade 8 commercial bolts for reinforced strength. The manufacturing process we use produces better adhesion to the steel substrate in your steel panels and your arch building's AZ Galvalume® steel is 700% more rust resistant than regular galvanized steel used in other types of kits. 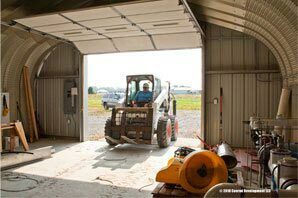 Custom Oregon metal garage kits are customizable with the addition of several types insulated or non insulated walk through doors that are built into your garage's end walls. 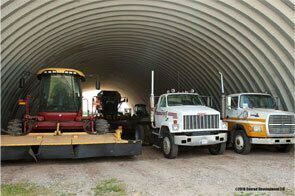 Your main entrance used for vehicles can be custom sized to allow enough width and height for any type of truck large enough for tractor trailers or commercial equipment. Choose your custom electronic roll up, sectional, or bi-fold overhead door or a manual sliding door. 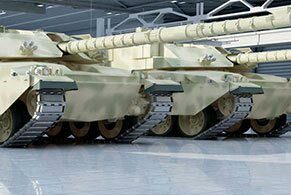 Doors can come insulated and are made of 16 gauge to 26 gauge reinforced steel. 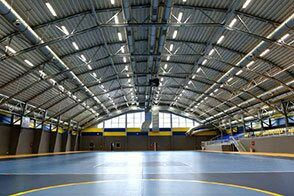 Your entire building if you choose, can be insulated as well by 3 methods. 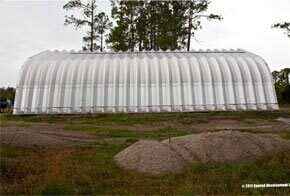 1) Spray foam 2) Roll fiberglass insulation, or custom insulated arch panels to keep your interior at a regulated temperature and guard against condensation. Check out our page that describes the different types you can choose from. Customize your Oregon metal garage with your choice of either 3 different style gravity vents, turbine or ridge vents that pull air up out of the building and create a nicer airflow especially when working in conjunction with louver air vents that are mounted on the walls for cross ventilation. Oregon's climate is perfect for natural air conditioning because of the cool climate. As Oregon's rainy season produces months of long misty rain, your arched roof system naturally drains precipitation off the building without the need for rain gutters and down spouts. Oregon's beautiful cascade regions, the Western Cascades and High Cascades with over 45 mountains are breathtaking. Metal Building Kings® team of engineers travels up and down the coast from St. Helens, through Portland, Salem, Eugene, and Medford back around and up through the middle of the state starting at Crater Lake around around Three Sisters, Jefferson, Hood and Rainier and up to Glacier Peek. The cascade mountain range is amazing and home to some of the finest pinot wines and microbreweries. 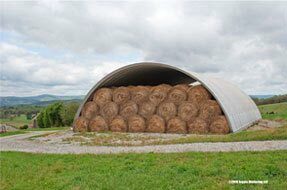 Many industries use our arch steel buildings because they are a reliable way to facilitate inventory and storage in a climate that demands longevity. Oregon arch buildings last decades without the need for new paint, sealing leaks, or dealing with rot or rust. Some of our customers in the Willamette valley have had metal garage kits in Polar White for over 50 years and they still look relatively new. You can loom through the list of some of our Oregon Customers and the cities they live in where their structures are built and see the models and price discounts they received. One you have custom designed your garage kit and placed your order we will send you any documentation you need for permits and inspections such as blueprints, floor plans, materials and component specifications. Our Turnkey services are here to help you with land surveys, erecting your building, and laying your monolithic foundation by recommending the right subcontractors who specialize in metal buildings. 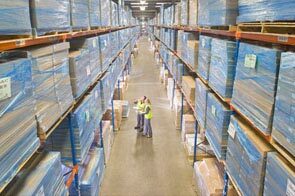 We can provide everything you need from planning to construction. Access our statewide network of sub-contractors we have worked with in Oregon who are licensed and certified. 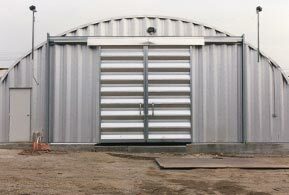 Metal garage kits and steel buildings are popular in Oregon for workshops, warehouses mining equipment storage facilities and for both business and residential use because they are certified as the best pre-engineered building system to withstand wind storms up to 170 mph winds and even some earthquakes. 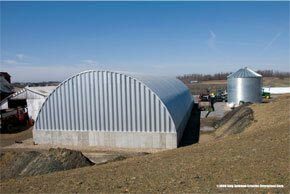 Steel arch buildings are secured right into the cement foundation with steel base plates and bolts that secure the structure in place. The arch building design allows our metal garage kits to stand up to high velocity wind and seismic activity like no other prefabricated or pre-engineered steel building can. 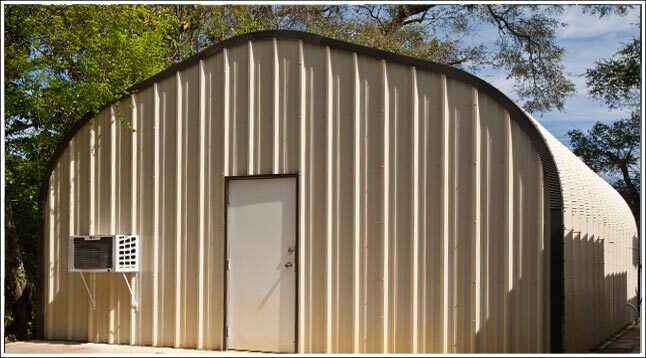 Our metal building's integrity and your safety is second to none and our ability to manufacture these buildings factory direct keep prices among the least expensive among all types of metal garage kits and sellers of arch buildings. Be sure to check out our clearance sales going on that have in-stock buildings and garages at discounted prices. Also learn more how your Oregon metal garage is priced out by visiting our pricing page. Every metal building is custom manufactured to Oregon's specific codes and certifications. Read here for more on Oregon building codes. • The P Model for Oregon workshops, residential and small business.